Climate Change A Reality: Durban Takes On Equity And Glaciers In Himalaya | Quest That Change…. This UN conference on climate change (COP) remained a place where the people from around the world discuss, debate and come to a conclusion on various confronting issues our communities face around the world on climate change. In this note I am trying to discuss three important aspects of this conference on climate change research, fair and equitable emission deal and climate financing. In COP 17 we observed three types of actors; the political, scientific and activists, while each one of them is playing an important role in the negotiation process. Almost the final negotiation talks are underway through various processes as mentioned in my last article (Link>>), that they will revolve around two aspects of; growing momentum of action and the alarm bells from new climate change research. The deliberations remained around implementation of Bali and Cancun agreements those contain institutional arrangements, technology mechanism, constructing adaptation framework and green climate fund. The Durban expectations revolve around decisive and immediate action on a comprehensive deal by giving a direction to Kyoto protocol and climate action funding. The divide also observed in filling the climate fund basket, where the developed nations refrained themselves to commit for it while developing nations find it a legal binding on developed countries on a historical perspective. Reports released during this week by International Centre for Integrated Mountain Development (ICIMOD based in Nepal) suggest that the Himalayan Mountains are at risk due to climate change. It concedes that there are 54,000 glaciers in an area of 60,000 square kilometres in the region, by now 10 have been studied in last 3 years, enough to chronicle the net ice and snow loss in central and eastern Himalayas. Based on various GIS images this study revealed that the rate of glacial loss almost doubled during 1980-2005 and finds that in Nepal 21 percent and in Bhutan 22 percent glaciers reduced in size during last 40 years (1970-2010). The report states that the major impact on the glaciers due to climate change has been observed in the Tibetan plateau and an overall decrease in snow cover across Hindu Kush Himalayan region. Through these reports the scientists have shown their concerns with change in the region’s fragile ecosystems and the high possibility that melting glaciers may affect the lives of 210 million people directly and 1.3 billion indirectly in the river basins of the Hindu Kush-Himalayan region. However, there are varied scientific observations coming on these reports in terms of sample size, study methodology and determining the net gain or loss in glacial mass in Himalayan region by studying only 10 glaciers. The Director Wadia Institute of Himalayan Geology (WIHG) Dr AK Dubey has said that the conditions of Himalayas are controlled by the winter snowfall rather than external factors like much hyped global warming. He has rejected the global warming theory and told that the Himalayas are quite safer zone on earth, where global warming has no role in controlling the conditions. Whatever predictions about Himalayas are being made are based on short-term studies conducted on glaciers, which have no comparison with Himalayan glaciers, he told to Hindustan Times an Indian National daily (Link>>). It is the fact that in Himalayan region the availability of accurate historical data remained a core concern to the scientists to conclude about impact of glacial melt on climate. While only a few studies of glaciers had been published in peer-reviewed science journals, there was a large amount of raw data with similar conclusions, says Dr. Pachauri. The leaders in an African group finds that climate change is leading to the death of over 350 thousand people annually and an urgent need for deep cut in green house gas emissions. The UN Secretary General Ban Ki Moon finds that the poor are most affected due to climate change and there is no time to loose in implementing climate adaptive programs in ground. Ms. Sunita Narain, Director General of Centre for Science and Environment (CSE, India) says that based on various scientific evidences climate change is a reality and countries in South Asia have already realized it in terms of more variable and extreme events. She also feels that there is a north-south divide on climate change data and also the way media reports present them. On a recent report of IPCC on Extreme events Dr. Rajendra Pachauri concludes that single event can’t be attributed due to climate change, but the trend, data and observations over long period of time on intense events and increase in their intensity and frequency of some extreme events. On the critic of this report, he says that truth can be blunt and IPCC is trying to put best science in place and the report is based on strong science. He also informed that Arctic ice is melting double the rate of the melt in other parts of world, and the IPCC’s two reports including 5th assessment report will be released soon those are based on very high quality of science. About ongoing discussion at Durban Dr. Pachauri believes that the decision making and policy agreement during COP 17 should be based on strong science and shown his disappointment that not enough attention is being paid to scientific realities of Climate change. He feels that if the negotiations are based on scientific facts it would yield more productive results from this conference. It is felt that the world needs to cut on the emissions immediately and drastically as they are directly linked to growth. Various groups at COP 17 feel that the conference is no more than a conference of polluters, as big companies are playing role in influencing the decision making processes. They are looking on this meeting in terms of real commitments and not as an empty shell. It has been recorded that 131 countries together in this conference are asking for 40-50 percent emission reduction by 2020, which at present rate will only lead to 13-17 percent emission cut, therefore, the activist groups are asking for a real outcomes from the conference. There are groups those feel that industrialized world has already emitted in the past for their growth while with a judicious agreement to cut emissions emerging economies need to emit for their growth and better future. The delegates from developing countries feel that based on disaggregated analysis it’s found that the emission from developing nations are still far less than countries like US, but this issue has not been discussed clearly and categorically. Delegates stressed that it is important that equal entitlements are given to developing nations to grow. Therefore, historical emissions should be part of the future negotiation and decision process on next commitment period on Kyoto protocol. Dr. Sunita Narain of CSE emphasized on equitable sharing, given that countries like India are not asking for a right to pollute but a right to its future development. To amplify the voice, the activist groups are planning a number of actions post Durban like; Global Referendum on Climate Change, asking for a more clear standing of each country government on climate change issue, and a Climate Justice Tribunal. They feel that the one percent capitalist of the world don’t want the welfare of 99 percent those are suffering due to climate change and ask the negotiators to ‘think about people rather about businesses’. Among major groups, the Vice President of World Bank informed that they are focusing on green financing and a greener growth for all that comes from low emissions. Given that the World Bank (WB) now has Africa as its focus region therefore it will work on greener growth proposition. The WB has 6.5 billion USD as Climate Investment Fund for poorest countries in Africa, of which 37 percent has already been disbursed in last 2-3 years. The types of Green Finances discussed at Durban are related to Carbon finances, Climate finances and Green funds, targeted to be given to poor communities around the world. The agencies are aiming that funding will be given in partnership of private and public bodies. It is interesting to note that of the most discussed annual 100 Billion USD financing, 80 percent will come from private sector and remaining from public sector. The public sector financing is seen as leverage mechanism for private financing to build right kind of adaptation and mitigation technologies and measures. The private sector agencies find itself critical partner in successfully implementing adaptation technologies and emission cut through public-private partnership. However, the only aspect of private sector financing would be that such institutions will look upon the risks involved in financing any project due to various reasons like; technology type, currency flow, country positions, etc. Therefore, in light of all deliberation on Green economy, Green Financing, Carbon finances, REDD+, adaptation committee on green climate fund, etc. 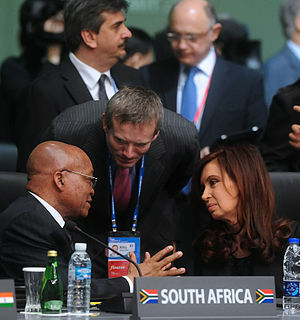 how the COP17 paves the path, will be a decisive moment for this conference. In light of growing awareness and realization at Durban on climate change issues, it will be important to note that how the world moves towards more climate resilient and low carbon path and how the governments work on a common goal to limit global temperature rise. Photo credit: UNFCC. K2 Mountain Photo by Ms. Noreen Haider, Pakistan. ← A Global To Region Perspective: Raising Mountain Voice At Durban !